Live music greeted attendees as they entered the doors of the Laurel Manor Recreation Center on Saturday setting the tone for the Visual Arts Association Winter Fine Arts Show now in its ninth year. The work of 59 artists, all members of the association, was beautifully displayed using all the rooms in the center. This show featured two-dimensional art. The Visual Arts Association awards scholarships to high school students who are going to pursue a course of study in the arts after graduation. The VAA is one of only two scholarship sources exclusively for art education in the state of Florida. Helen Poor, chairman of the scholarship committee, reports that to date they have given scholarships to 48 students. 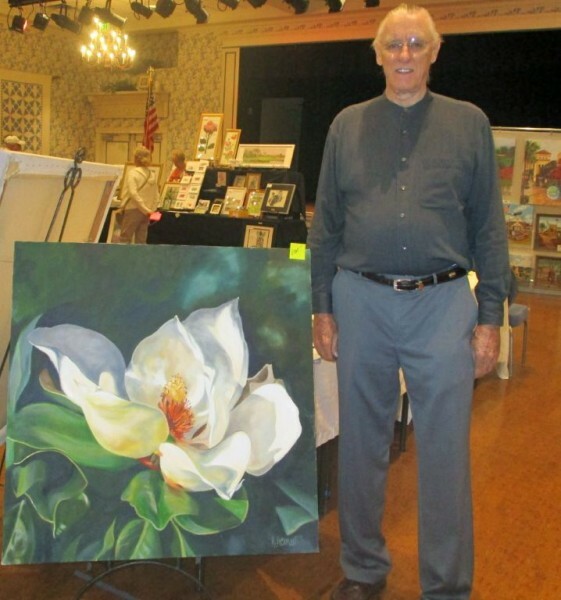 As part of their fund raising efforts attendees at the show had the opportunity to purchase tickets to win an array of prizes from beautiful baskets and theatre tickets to an enhanced GICLEE image of an oil work called “Magnolias in Early Light” donated by noted Villages artist Roger Sherman.